Let's be honest: under-ice coolant leaks are a pain. They're ugly, expensive to treat and they ruin the quality of your ice. No rink can afford that. Sure, you can manage them. You can add coolant on a regular basis, but that's an expensive hassle. If you go for a hard repair, you're looking at downtime and lost revenue. In many cases, you might not even have the budget for a hard repair, and/or you can't keep an inflated operating budget because you're managing the leaks, not fixing them. What can you do? seal under-ice leaks in ice rinks of all sizes. Rink Seal Pro™ is a professional engineered solution designed to seal under-ice leaks in your refrigeration system with industrial-strength bonds. Application is simple (installation directions are here), and Rink Seal Pro™ is very inexpensive compared to a hard repair. Even if you’re not considering a hard repair, Rink Seal Pro™ will pay for itself over time because you will reduce your operating costs by minimizing how often you have to add coolant to your system. Coolant is expensive, and you shouldn’t play cat-and-mouse with a leaking system. There’s a difference between managing leaks and fixing them once and for all. How does Rink Seal Pro™ work? Once installed in the refrigeration system, Rink Seal Pro’s™ suspended particles collect at the outside of the leak and penetrate inward, establishing a permanent seal on the outside of the leak. Rink Seal Pro™ is engineered to react only with the leaking portions of your system – everything else remains unchanged. Rink Seal Pro™ is ATSM D3147–06 tested. 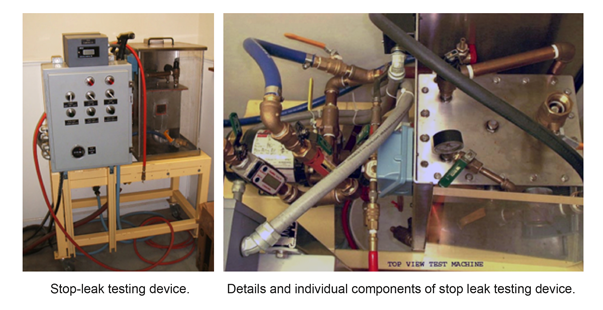 Standard Test Method for Testing Stop-Leak Additives for Coolants. This test method covers screening procedures for the preliminary evaluation of leak-stopping materials intended for use in cooling systems. The results of this test show that a 0.025 round hole and a 0.010 wide slot (crack) can be successfully sealed with this product. Over 100 years ago, Shaler introduced an innovative product to stop leaks in vehicle tires. Since then, Shaler has continued to create stop leak solutions for nuclear submarines, locomotives and many other industrial applications.